Ironed and strengthened. Even slimmer and faster but just as sophisticated, enduring and elegant as its predecessor. 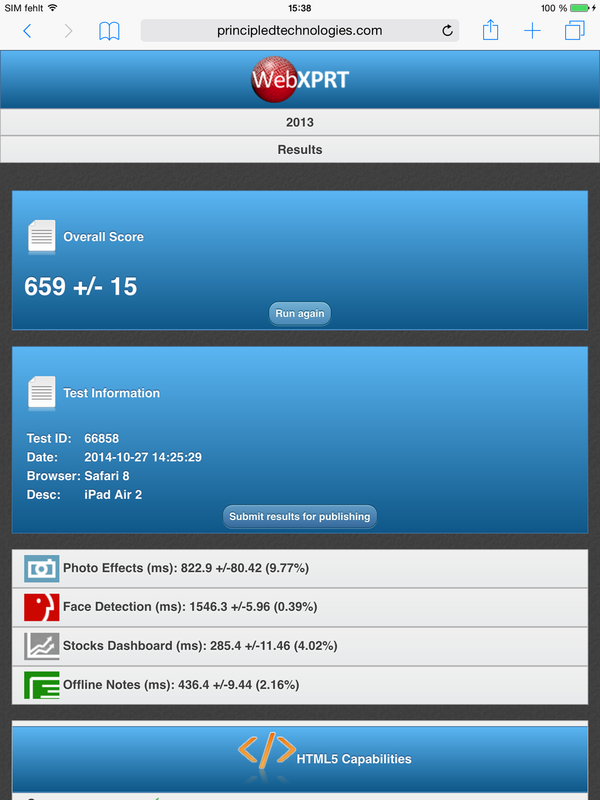 The iPad Air 2 is surrounded by many superlatives and is really the fastest iPad so far. 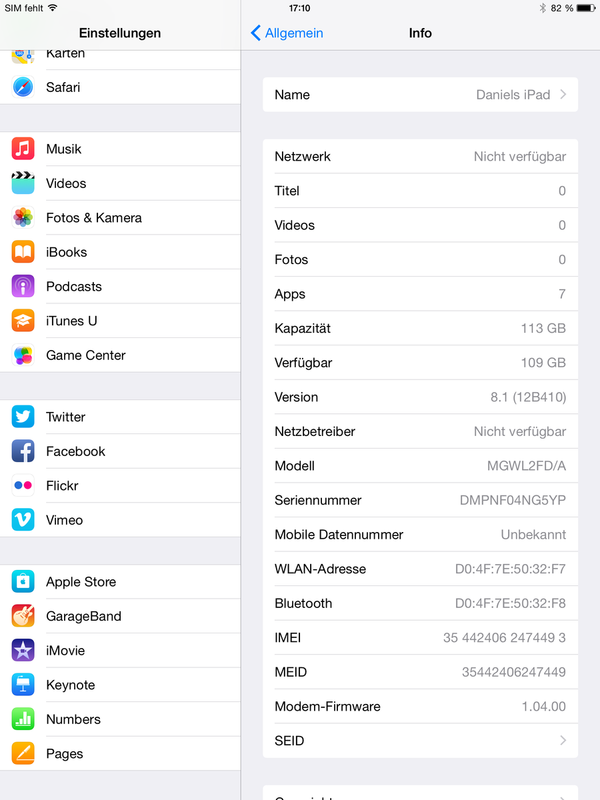 But there are also some smaller drawbacks, and iOS 8.1 is still not working perfectly. The Apple iPad Air 2 does not really differ from its predecessor in terms of design, it is only slightly thinner. However, there are big changes inside the case: The communication modules are faster, and the processor and the graphics solution also show significant performance advantages. Apple's iOS 8.1 fixes some problems of the previous version, but there are still issues, and some apps still do not run as intended. The display is as it was, only the viewing angle stability has improved even further. Apple has made small changes to the pricing. The 32 GB version has been completely discarded. The current iPad starts at 489 Euros (~$612; Wi-Fi only, 16 GB) and is more expensive. The storage extensions to 64 GB and 128 GB cost 100 Euros (~$125) each, and the optional LTE modem is available for an additional charge of 120 Euros (~$150). This means the top version (LTE, 128 GB) costs 809 Euros (~$1012), and this is also our review configuration. The fiercest competitors at the moment are the Samsung Galaxy Tab S 10.5 (LTE, starting at 499 Euros; ~$625), Sony Xperia Z2 Tablet (LTE, starting at 579 Euros; ~$725), the Microsoft Surface 2 (WiFi, starting at 309 Euros; ~$387), Nokia Lumia 2520 (LTE, starting at 325 Euros; ~$407) and the Google Nexus 9. 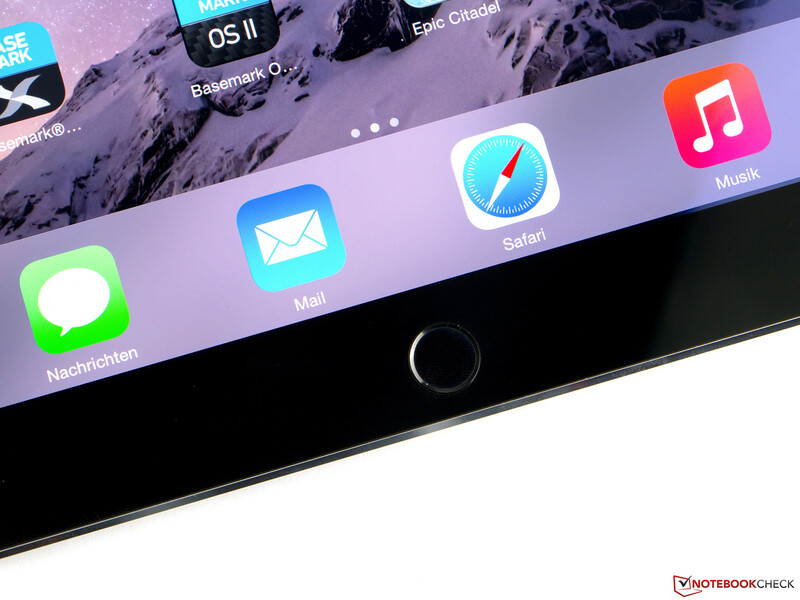 The iPad Air 2 convinces with its coherent design and great haptics. The Nano SIM slot is not flush with the rest of the case. Apple continues with its current product design, which means the iPad Air 2 is very similar to its predecessor and the dimensions are basically identical. Only the thickness is reduced from 7.5 to 6.1 millimeters (~0.3 to ~0.24 inches) and the manufacturer was able to save some grams in weight. The aluminum body feels really good in the hands. As well as the colors gray and white, the iPad is now also available in gold. However, the thin construction does not come without compromises. 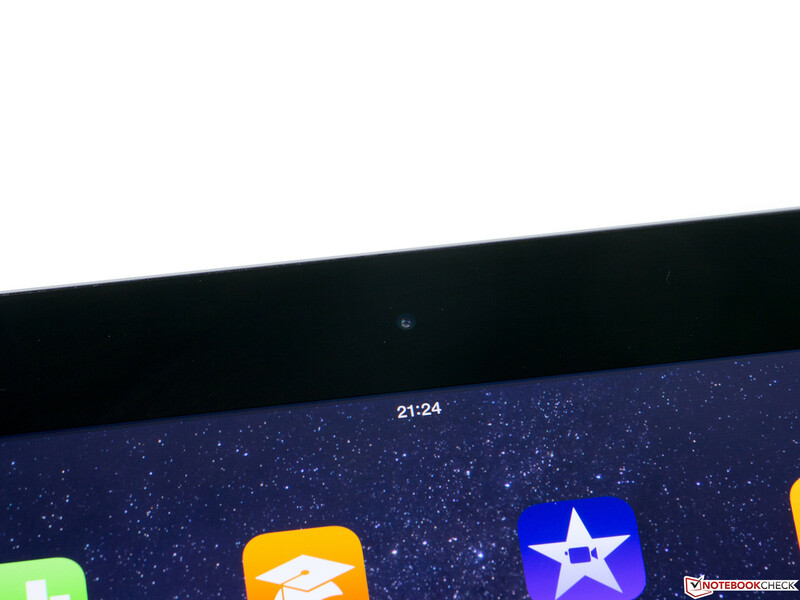 While the pressure resistance was perfect in the case of the iPad Air, the review unit suffers from picture distortions on the display even under medium pressure. The frame is not as sturdy either, and you can also see distortions under heavy pressure. The torsion resistance is good, only a lot of force will result in movements, but there are no creaking sounds. However, these drawbacks will hardly be noticeable during everyday use. 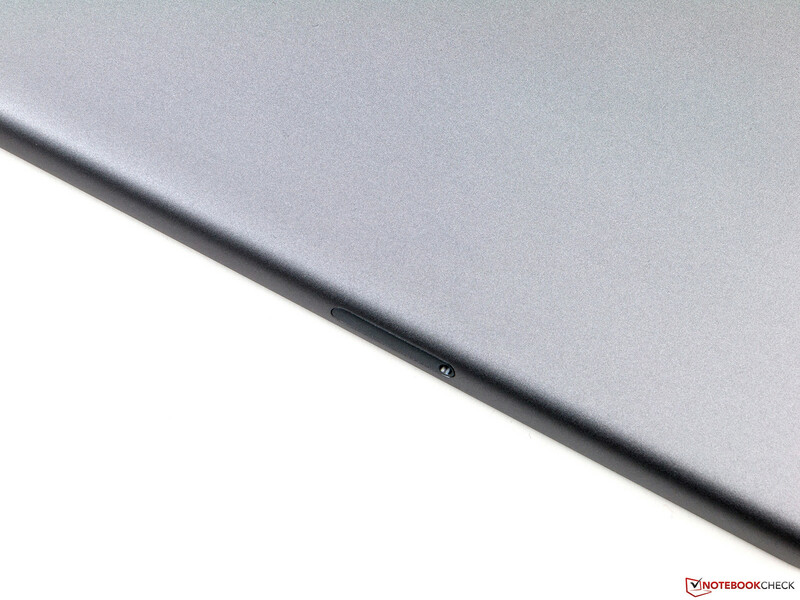 The battery of the iPad Air 2 cannot be replaced, and you will not find a slot for storage extensions, either. 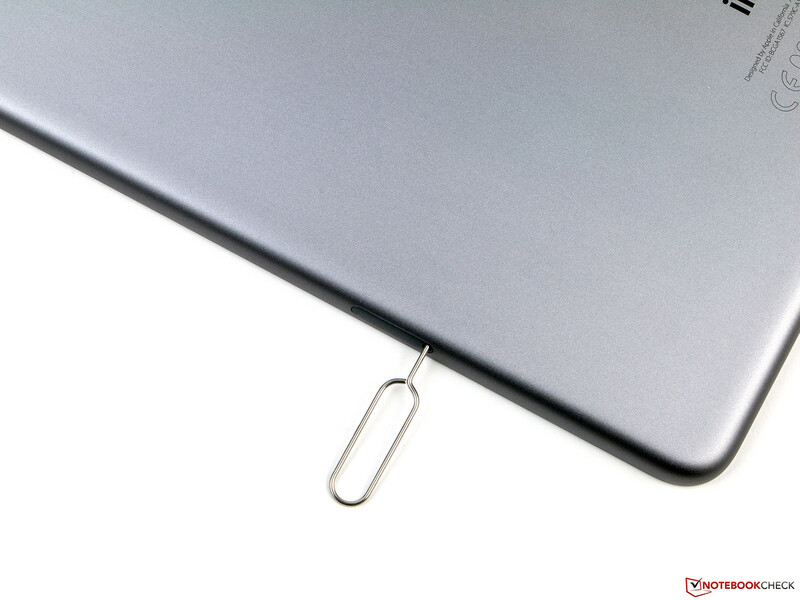 The Nano SIM slot can be opened with the provided tool, or a paper clip. 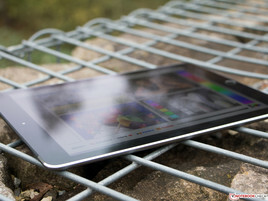 It is not flush with the aluminum body of the tablet, but sits in a small depression. The edges around the panel are rather sharp. By the way, the panel is supposed to be equipped with a scratch-proof and grease-resistant coating. Fingerprints are still visible very easily, but you can remove them with a good wipe. 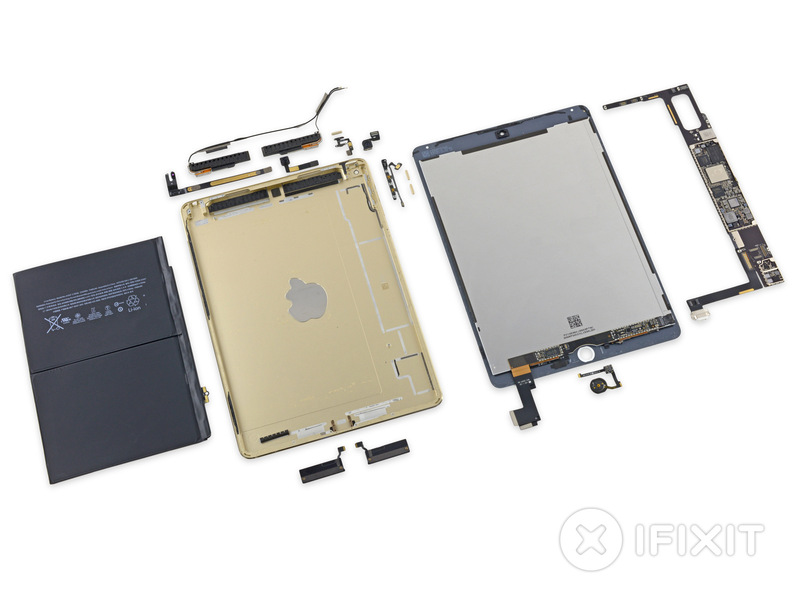 Our colleagues from iFixit gave the iPad Air 2 a bad score for repairability (2 out of 10). The massive use of glue in particular is criticized, since it does not only complicate the repair, but it also increases the probability of further damages. Nothing has really changed in terms of the connectivity. The Lightning port is still the only data interface, and can also be used as a digital video output via optional adaptors. Apple still does not offer the possibility to expand the storage via microSD cards, and the streaming standards like DLNA or Miracast are not available either. The Californians only use their own solution, AirPlay. We are rather surprised that the manufacturer has abandoned the configurable toggle. You could use it to either mute the tablet, or deactivate the automatic screen rotation. We will miss it. 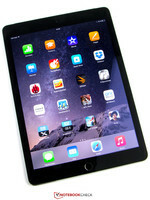 The Apple iPad Air 2 uses Apple's own operating system iOS 8.1, which was also the latest version at the time of this review. 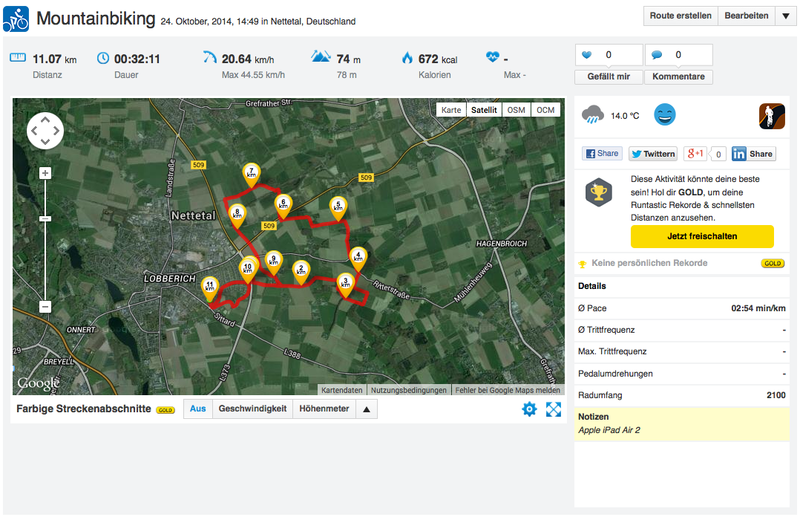 Some problems of the earlier versions have been fixed, but there are some new issues now. 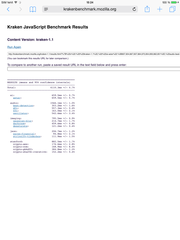 Many users report of continuing problems with the WLAN connectivity and connection dropouts. 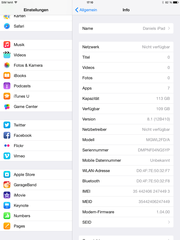 Some apps also seem to have launch and stability issues when they are connected with iCloud, and users of iCloud Drive seem to have more problems. A new feature of version 8.1, is Apple Pay. However, Apple's payment service is currently only available in the United States and does not work without problems. There are occasionally some issues with rejected credit cards, but the biggest problem is often the complicated integration of the payment process into the corresponding apps. There is no date for the rest of the world, so the component is still deactivated in other countries. 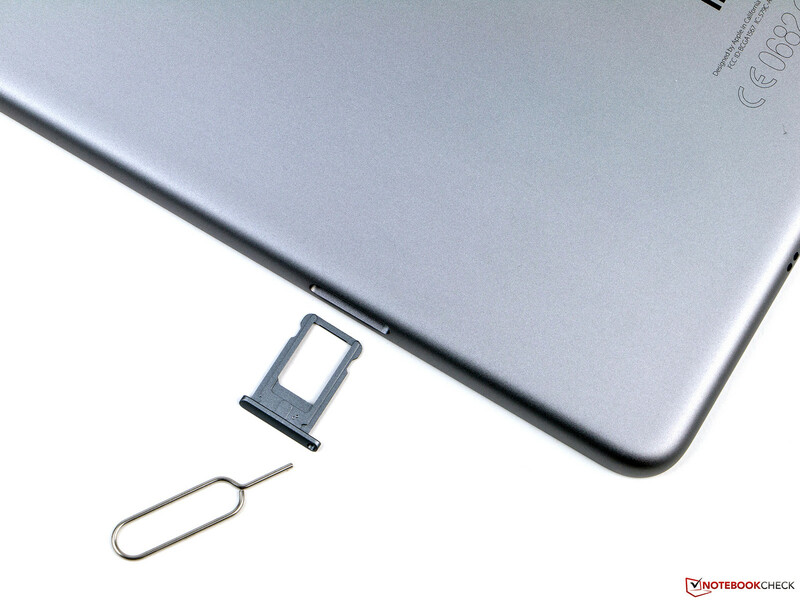 The required NFC module is also integrated into the iPad Air 2. However, there are no antennas, so Apple Pay can only be used for online shopping. The WLAN module of the iPad Air 2 supports the IEEE-802.11 standards a/b/g/n/ac and works with 2.4 as well as 5 GHz networks. It manages transfer rates of up to 866 Mbps, which is pretty fast. However, the range could be better, but it is still decent. While we were able to measure ping times between three and nine milliseconds in direct proximity to our router (Fritz!Box 6360, 2.4 GHz), the results increased significantly with a distance of 20 meters (~66 ft). The average result in this scenario was 15 ms. However, we also had some timeouts at this point, and the signal quality fluctuated between average and weak. Mobile connections to the Internet can now be established via HSPA+ and LTE Cat. 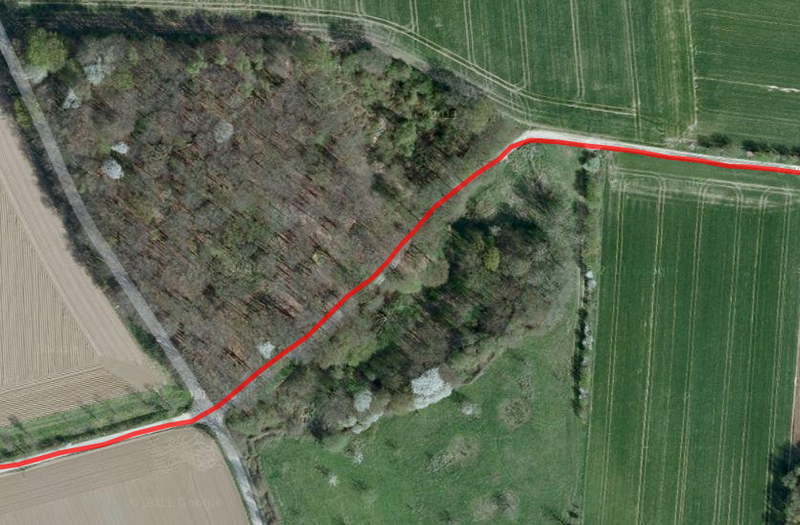 4 (up to 150 Mbps downstream). A positive aspect is the wide coverage of frequencies. Unfortunately, you do not get the faster LTE Cat. 6 standard, which could be twice as fast. 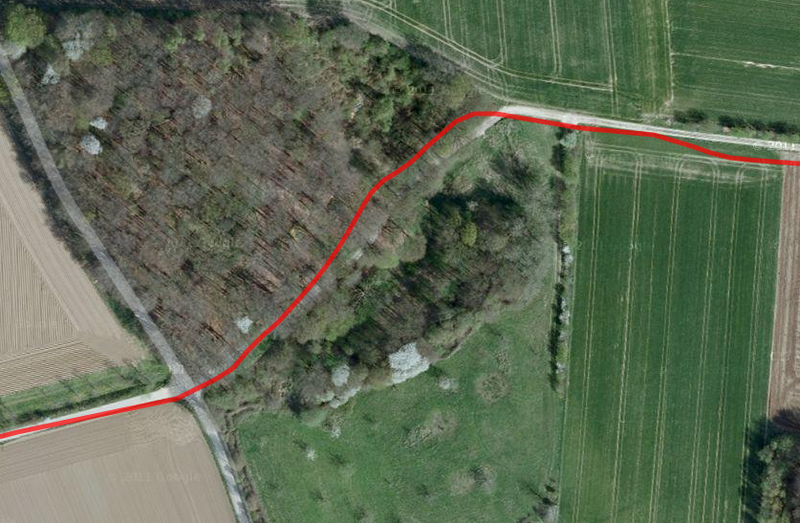 Short distance connections are possible via Bluetooth 4.0. Unfortunately, Apple does not integrate the newer standard 4.1, which would have been particularly nice in combination with the LTE module. 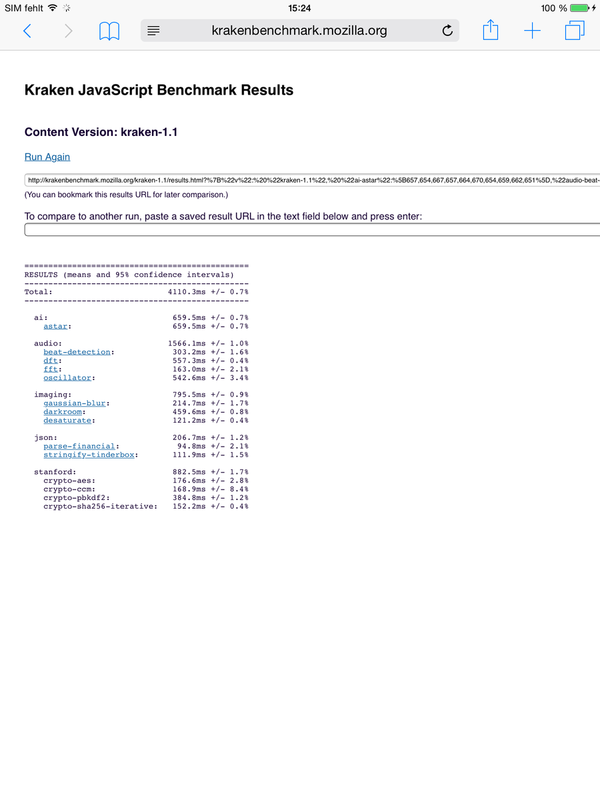 The component has no problem to stream contents. However, you can clearly hear signal noise when the tablet is connected to an external speaker, even if there is no sound. 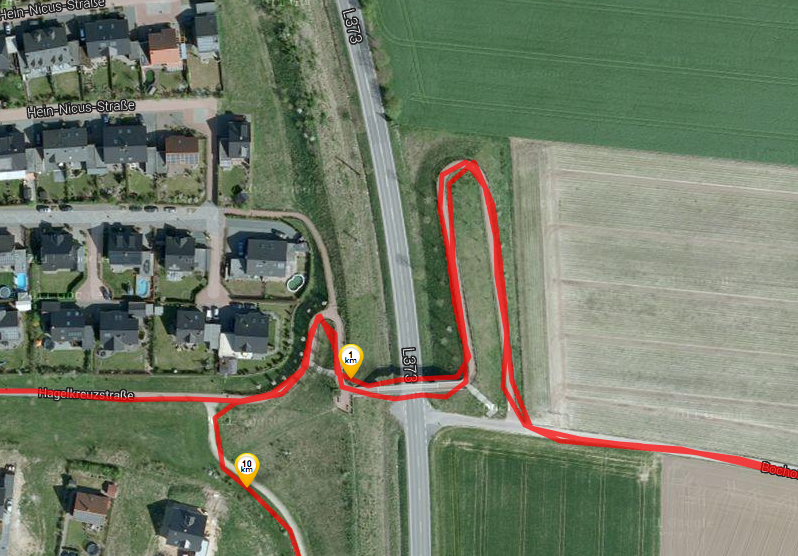 The iPad Air 2 can locate your current position via GPS and GLONASS, and it is pretty quick even indoors. There is basically no delay outdoors. 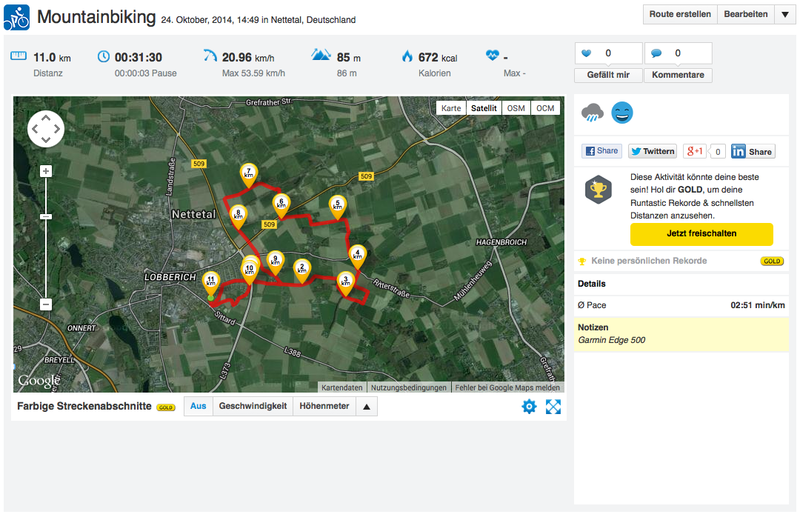 We checked the accuracy of the GPS module in a comparison with the bicycle computer Garmin Edge 500. Our review unit manages an excellent result. 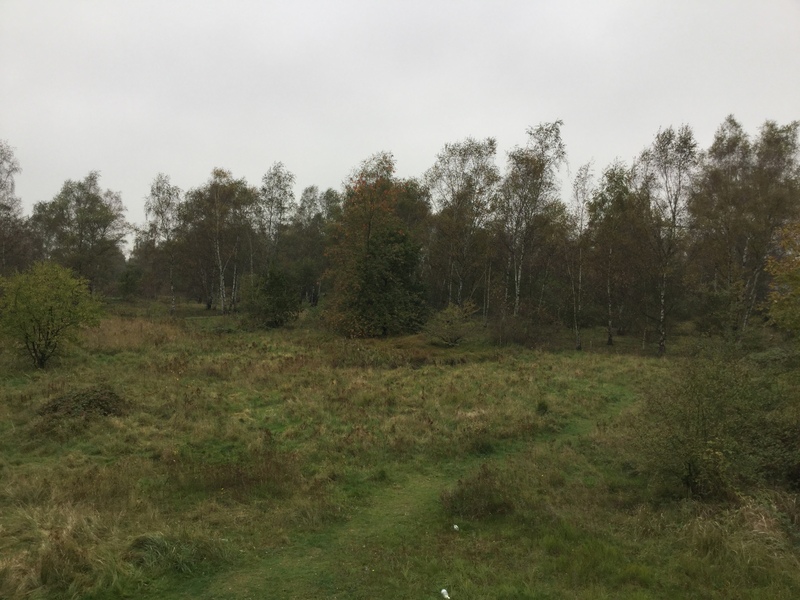 Even the complex sections or difficult signal reception conditions such as the forest, are no problems and the location was always precise and reliable. The tablet is even more accurate than our GPS specialist. The front camera of the Apple iPad Air 2 has not changed compared to its predecessor, it is still a 1.2 megapixels sensor (1280x960 pixels). The pictures are not really sharp, but the webcam is primarily designed for Apple's own FaceTime. The camera works well for these video calls and captures a lot of light (aperture f/2.2). 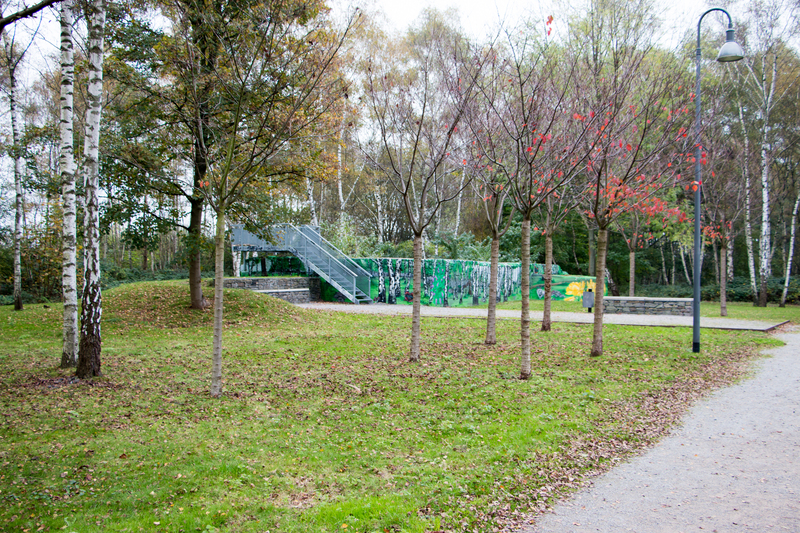 The main camera at the back has received a small upgrade and now has three additional megapixels. The resolution is now similar to the iSight versions in the iPhone with almost 8 megapixels (3264x2448 pixels, 4:3). However, unlike the version of the current iPhone, the camera can only record slow-motion videos with 120 fps. A new feature is the burst-shots (sequence mode). The picture quality is actually pretty good in the daylight. Only the colors could be more vivid and the pictures could be slightly brighter in general. However, the camera of the iPad Air 2 reaches its limits with very detailed objects, so the contours start to blur. 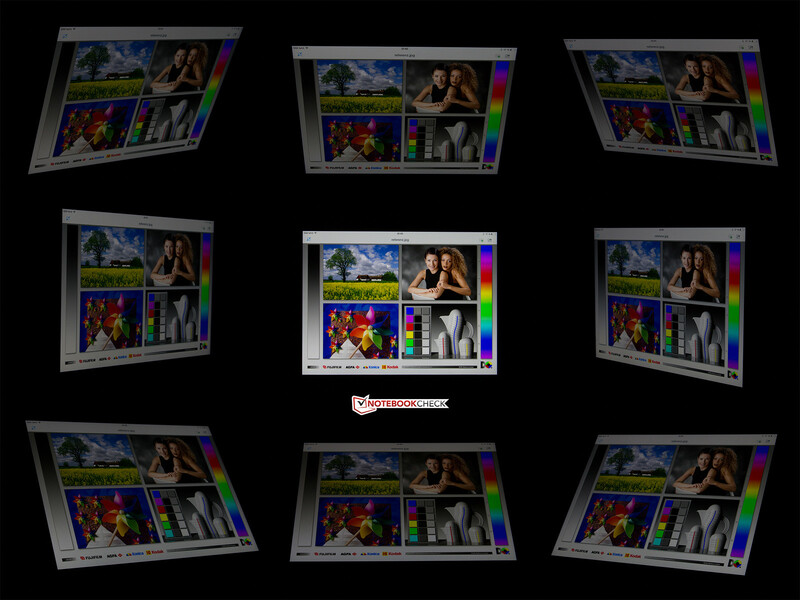 The quality quickly decreases under bad lighting conditions, where the edges are frayed and blurry. 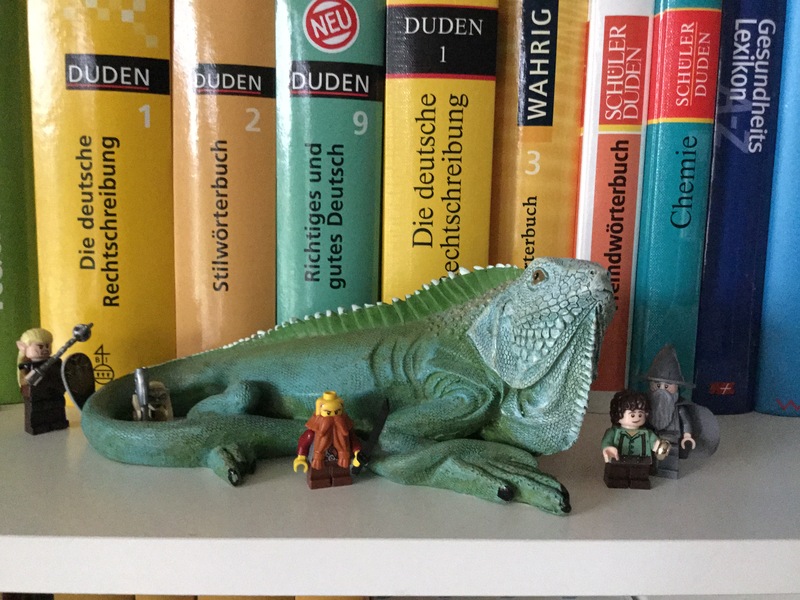 Still, the colors are accurate. The exposure time is increased as well, so moving objects can be blurry. 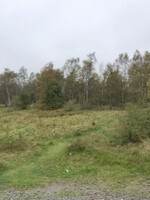 The familiar Panorama mode is also available. You need a very steady hand, but even then the results are not always great. 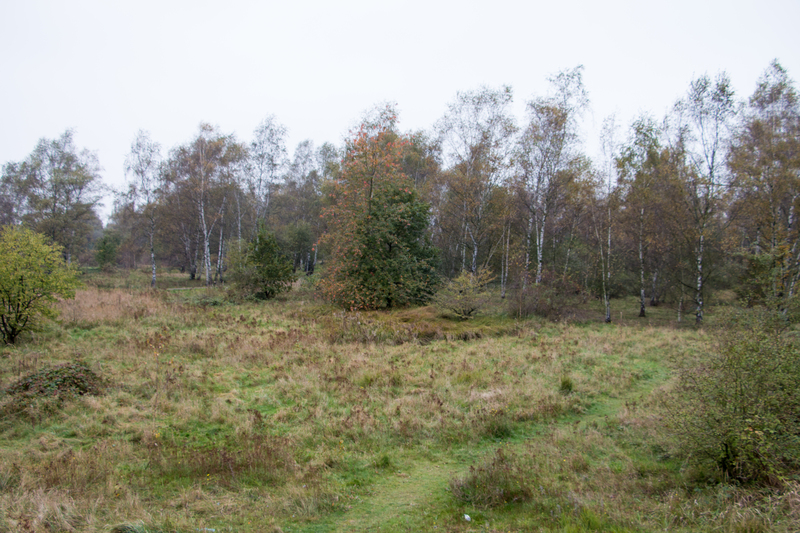 The pictures have visible transitions at some points, and the edges are shifted. The tablet can record videos in 1080p (1920x1080 pixels, 16:9, 25 fps). The quality is decent, but decreases under bad lighting conditions. However, the effect is not as strong as with pictures. Sound is recorded in stereo, and the quality is good. There are no surprises when we look at what is supplied with the iPad Air 2: as well as a data cable (Lightning to USB), a tool for the SIM slot, two Apple stickers and the quick-start guide, the manufacturer includes a modular power adaptor. The latter has a nominal output of 10.71 Watts (5.1 Volts, 2.1 Amps) and is therefore less powerful than the module of the predecessor (12 Watts). Apple offers several optional accessories in its store. Among others, you can buy the familiar 12-Watt PSU for 19 Euros (~$24). Apple offers a warranty of 12 months for the iPad Air 2, which includes a 90-day phone support. The warranty extension Apple Care+ (99 Euros; ~$124) extends the warranty period to 24 months, and has to be purchased within 90 days of the device purchase. It also covers two accidental damages. However, Apple charges a service fee of 49 Euros (~$61) for every repair. 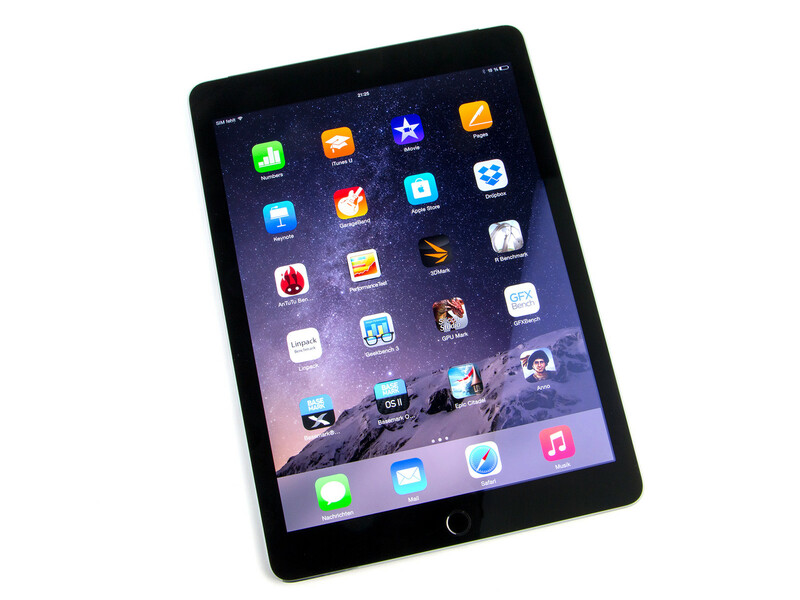 The inputs on the Apple iPad Air 2 are through the 9.7-inch captive touchscreen. It reacts very precisely, and inputs are executed quickly. However, we noticed that it was very tricky to choose adjacent items while we played Anno, the last bit of precision is still missing. The gliding capabilities are good, but you can feel the slight roughness on the glass surface if you move your fingers slowly. 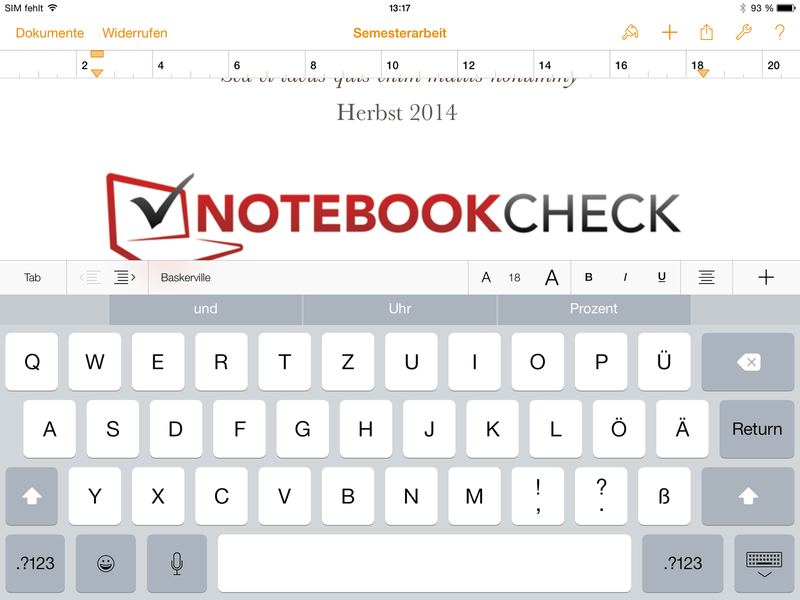 The on-screen keyboard offers the expected quality. However, considering the large display surface, we would have liked to see an additional row for numbers or special characters. The QuickType keyboard, which is already familiar from the current iPhones, is now available in the iPad as well, and adds word predictions for the current and the next word in a row above the standard keys. 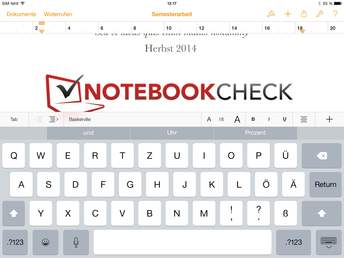 Since the introduction of iOS 8, it is also possible to add third-party keyboard layouts. The physical buttons have a firm travel and a precise pressure point. The home button of the iPad now includes Touch ID, which is very reliable. The display of the iPad Air is still very good. 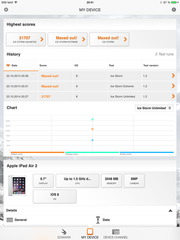 If you only look at the specifications, then the display of the iPad Air 2 does not really differ from its predecessor. The display size is still 9.7 inches with a resolution of 2048x1536 pixels, which results in a screen ratio of 4:3, and a pixel density of 264 ppi. This means Apple does not offer a technological highlight, but it is still at a very good level. The Samsung Galaxy Tab S 10.5 (10.5-inch, 2560x1600 pixels, 288 ppi) has a slightly higher pixel density, but is also slightly larger. The display is now completely laminated, and the new technology leads to some different measurement results compared to the first iPad Air (up to 473 cd/m², 90%). The luminosity is slightly lower with a maximum value of 447 cd/m², but the brightness distribution has been improved, and is now at 92%. The brightest device in this comparison is still the Lumia 2520 (up to 753 cd/m², 82%), while the Tab S 10.5 falls behind with just 314 cd/m². 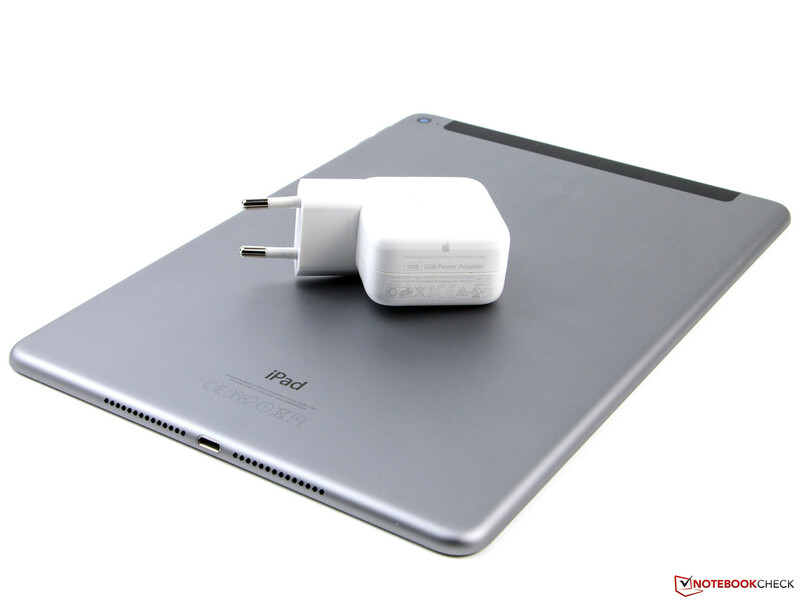 However, this value does not tell the whole story since the Tab S can reach up to 500 cd/m² with its brightness sensor. 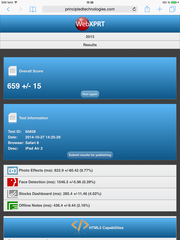 The latter does not affect the results of the iPad Air 2. Compared to its predecessor, the new iPad Air unfortunately has a higher black value of 0.61 cd/m², which results in a contrast of 693:1. The Galaxy Tab S 10.5 (0.0 cd/m², ∞:1) is in a league of its own thanks to the OLED panel, but all the other rivals manage higher contrast ratios as well. 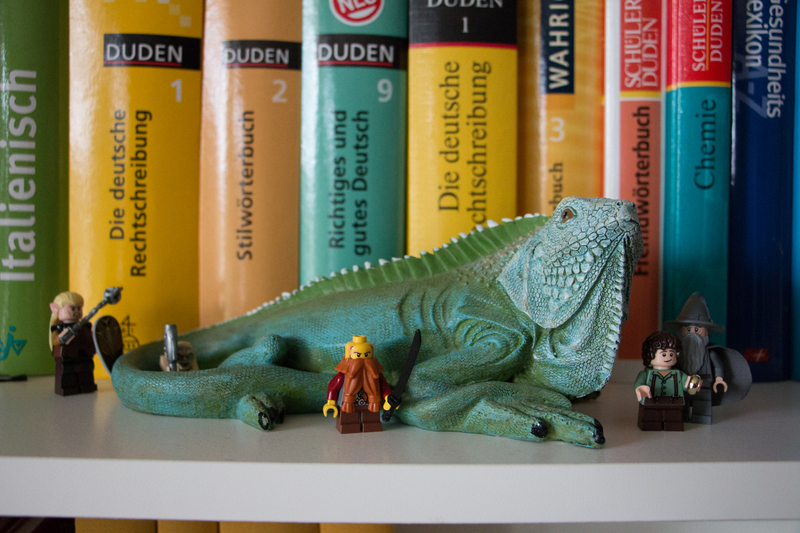 The color accuracy of the iPad Air 2 is very good. 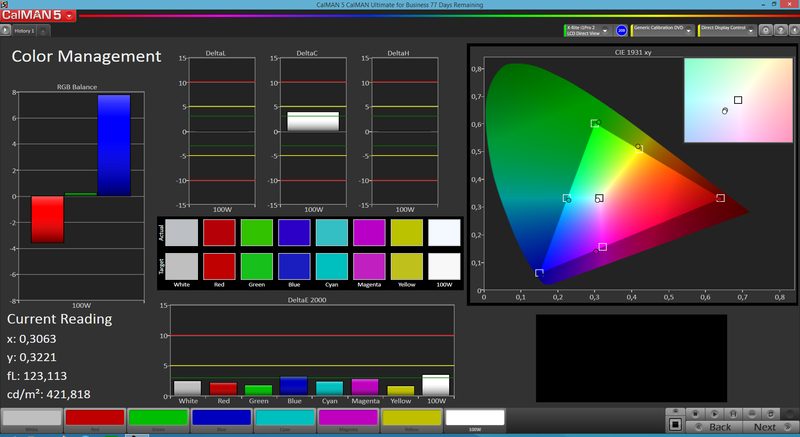 According to our colleagues from DisplayMate, the panel also covers the full sRGB color space. 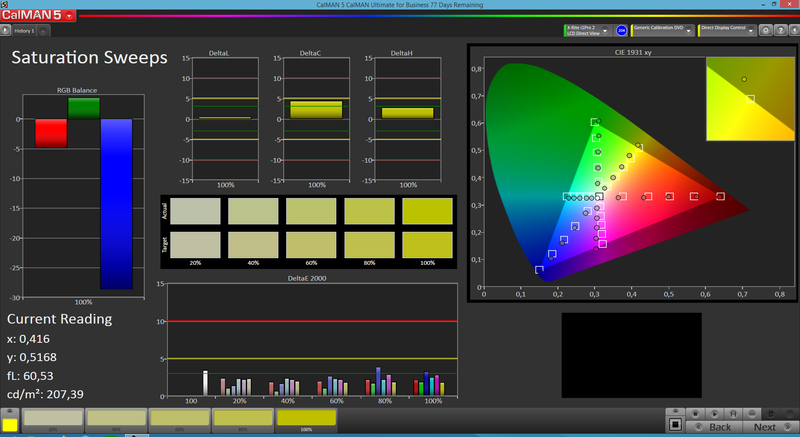 No color exceeds a DeltaE value of 4 in the grayscale and a DeltaE value of 5 in the ColorChecker. There is only a barely visible blue cast with a completely white display. 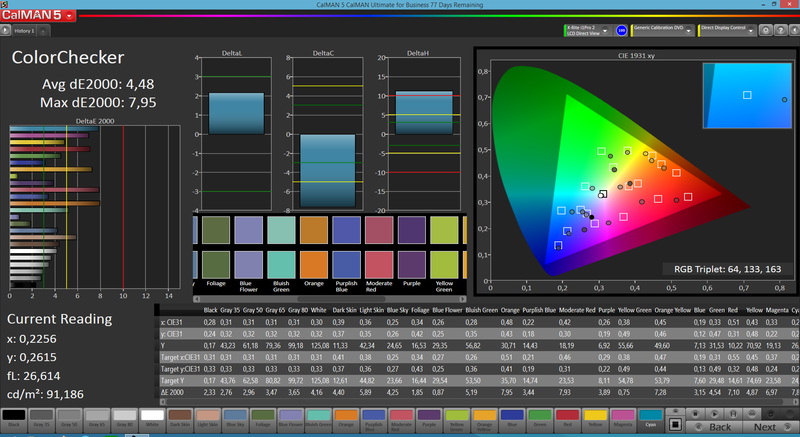 The review sample is only beaten by the Tab S 10.5 in these disciplines; it is slightly more precise, and can just display more colors thanks to the larger color space coverage. Despite the lower contrast ratio, the Apple iPad Air 2 leaves a good impression outdoors. This is probably a result of the less reflecting display surface. Still, it will not be easy to use the tablet under direct sunlight. Bright environments on the other hand should not be a big problem for the tablet. 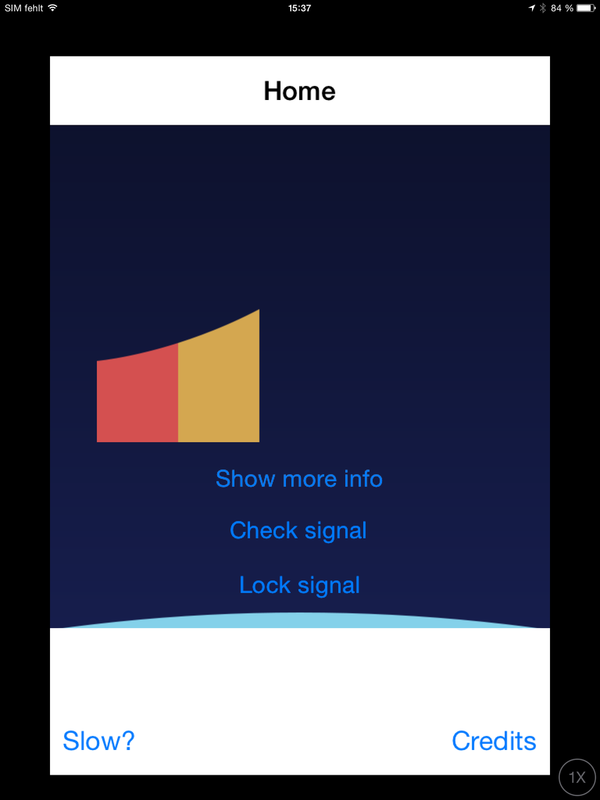 The ambient light sensor is also very reliable and quickly adjusts the illumination according to the current environment. The iPad Air 2 on a cloudy day. The viewing angle has to be very steep before the reflections become annoying. The viewing angle stability of an IPS display is usually really good. This is also the case for the iPad Air 2, that uses this technology. 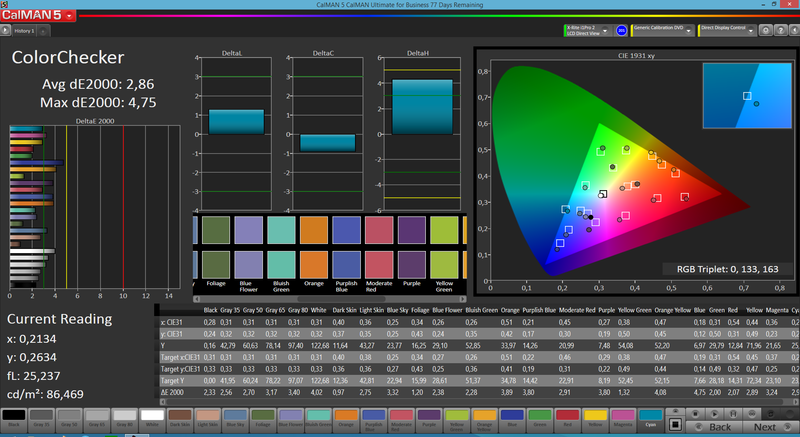 There are no color changes, even with extremely flat viewing angles, only the brightness of the panel is reduced when the angle is larger than 30 degrees. The new device shows no sign of the ghost effect in the first iPad Air. This is the big advantage of the completely laminated display since there is no gap between the glass and the actual panel, which could cause this effect. 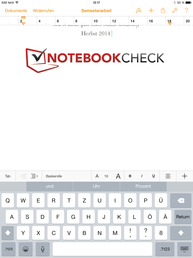 The Apple iPad Air 2 has a couple of new features. 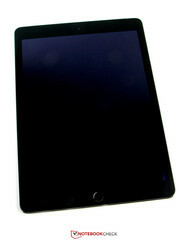 The integrated Apple A8X processor is the first triple-core processor and this version is also the first tablet from the Californian manufacturer with 2 GB of memory. 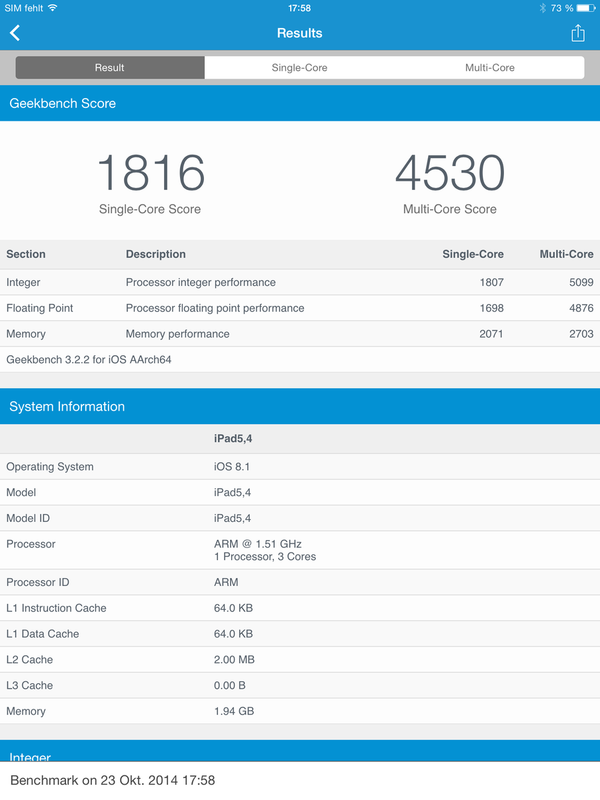 But the CPU does not only have an extra core and a higher clock of 1.5 GHz compared to the A8 in the iPhones, it also has twice the amount of L2 cache. With three billion transistors, the Apple CPU even exceeds current high-end desktop processors from Intel (up to 2.6 billion). 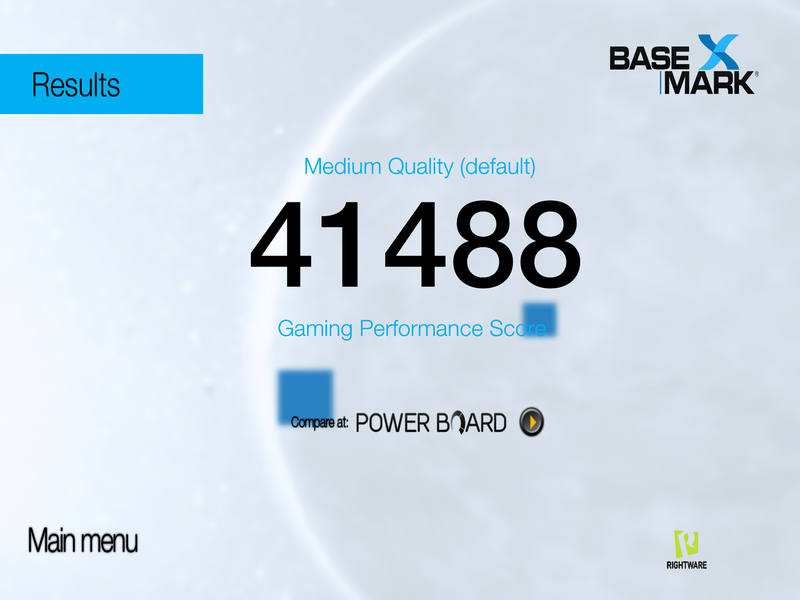 The new GPU is significantly faster too, the Imagination PowerVR GXA6850 is currently one of the fastest components. 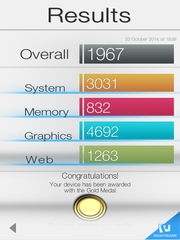 The hardware manages great results in the benchmarks. The Multi-Core test of Geekbench 3 achieves 4,530 points for our review unit, which is similar to an Intel Core i5-4200U, and leaves the rest of the rivals behind. 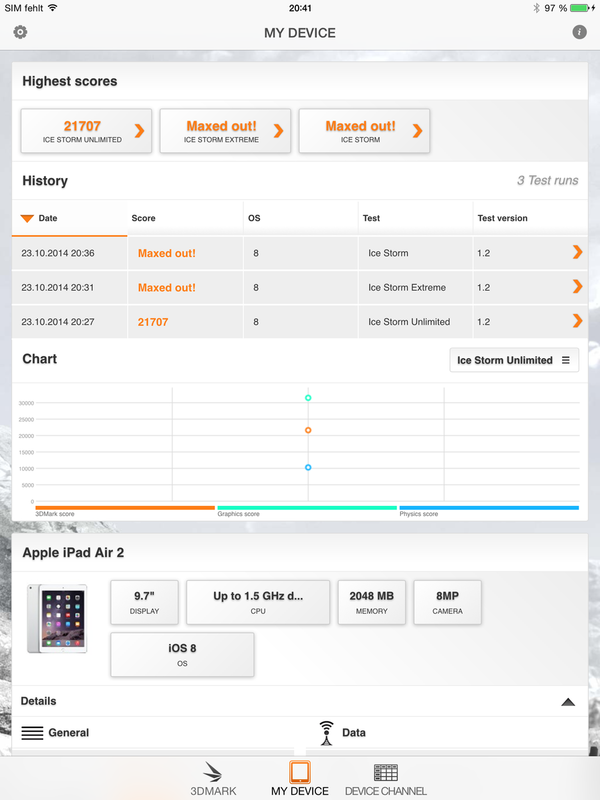 The situation changes when we look at the Physics score of the 3DMark Ice Storm Unlimited, where the iPad is in the bottom third within the comparison, and roughly on a level with the MediaTek MT6589. 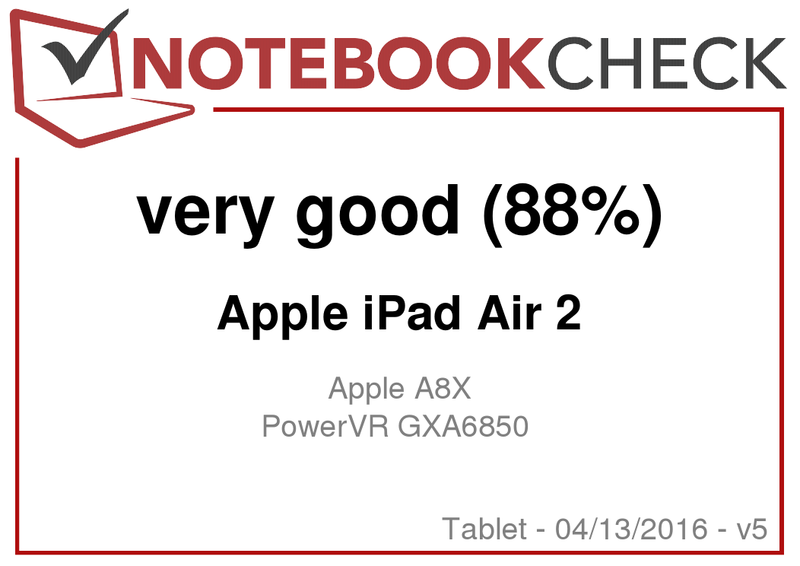 However, the good results are only possible when the device is cold, and the performance of the iPad Air 2 drops significantly after a prolonged period of stress, which is simulated by the Relative benchmark for one hour. 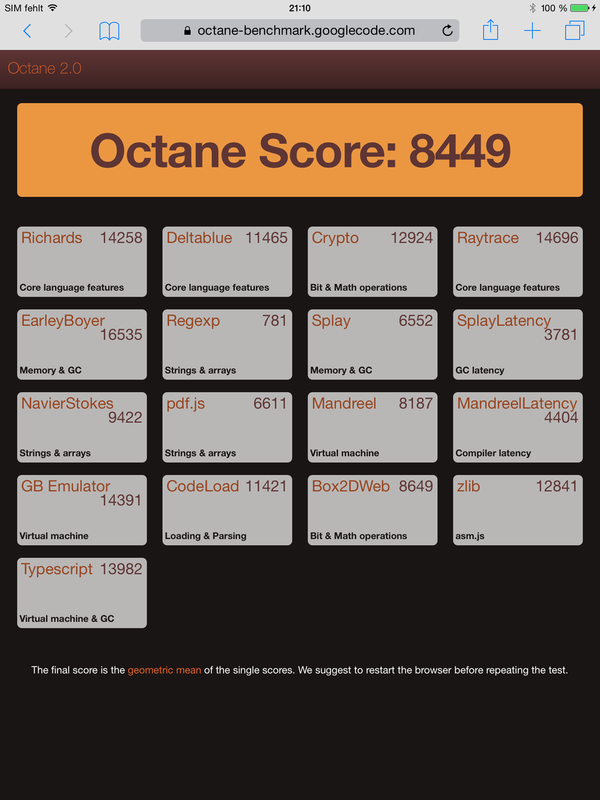 All the benchmarks afterwards achieve lower results: The Geekbench Multi-Core score drops to 3,145 points (minus 31%) and the 3DMark Physics score drops to 7,632 points (minus 27%). The CPU is not the only thing affected by the throttling. More details will be covered in the Temperature section. There is no performance reduction when the battery capacity is low. 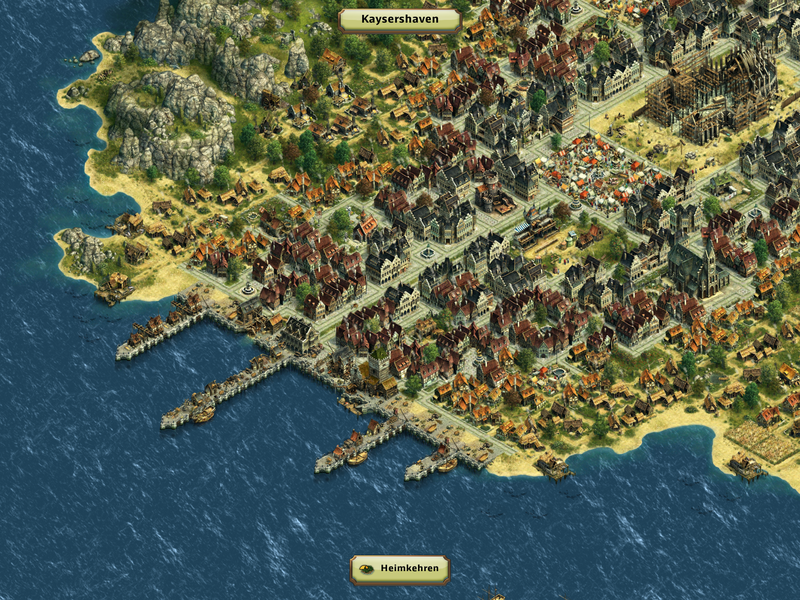 The graphics unit is very fast, but cannot quite compete with the Tegra K1 SoC (32-bit). 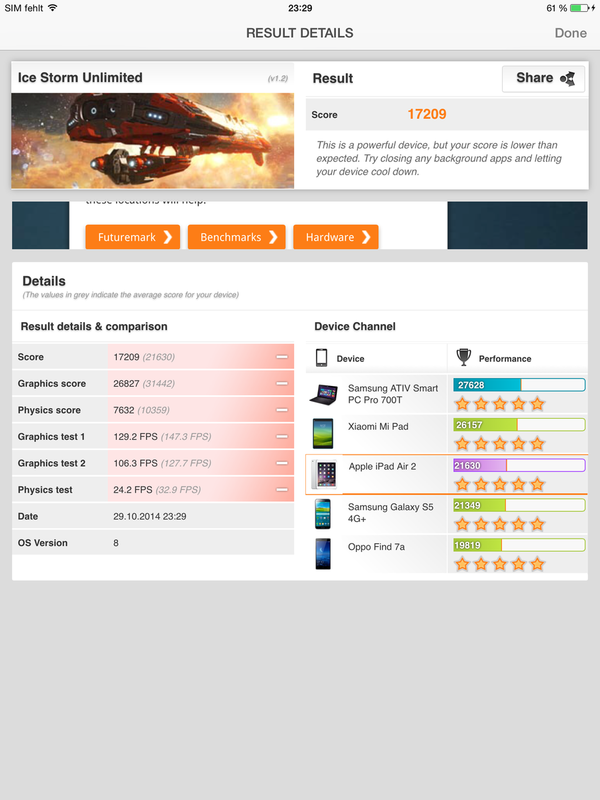 The Nvidia Shield Tablet manages a 26% higher score in the 3DMark Ice Storm Unlimited Graphics test. 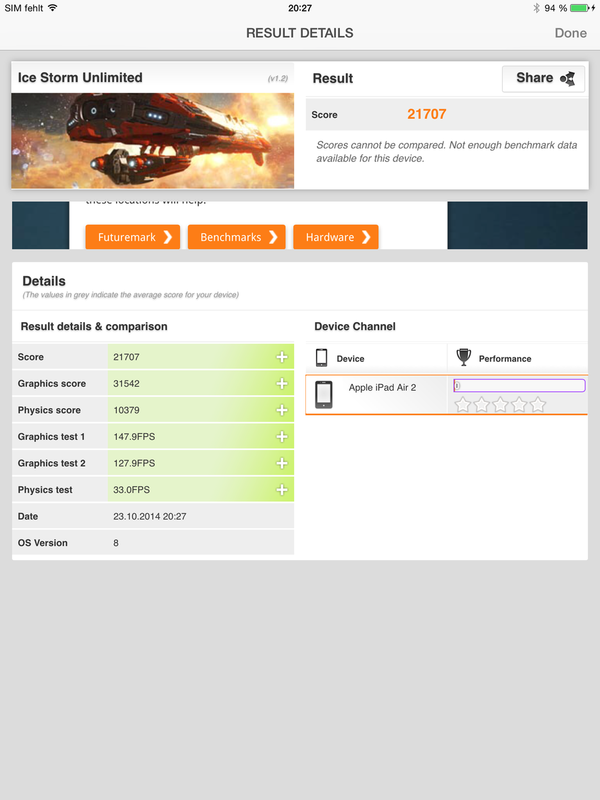 Like the Nexus 9, the gaming tablet from the GPU specialists uses the Tegra K1 SoC. 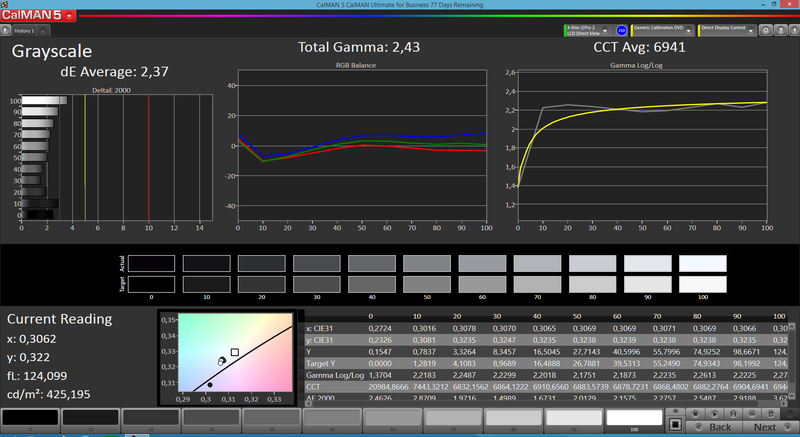 Basemark X 1.1 (Medium Quality) shows an advantage of 13% for the GXA6850 of the iPad over the K1 Kepler GPU. 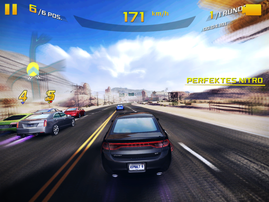 The advantage disappears in the High Quality test, and the two rivals manage similar results. The two SoCs are also neck and neck when it comes to the performance crown; unfortunately we cannot deliver any results for GFXBench. 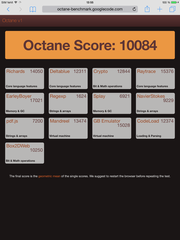 This test can be completed in the current version (3.0.23), but it does not show a score. We could also notice GPU throttling under continuous load, which results in a performance reduction of around 15% in 3DMark. 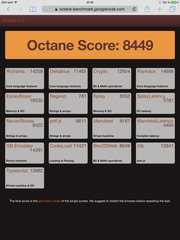 The browser performance of the Apple iPad Air 2 is great. 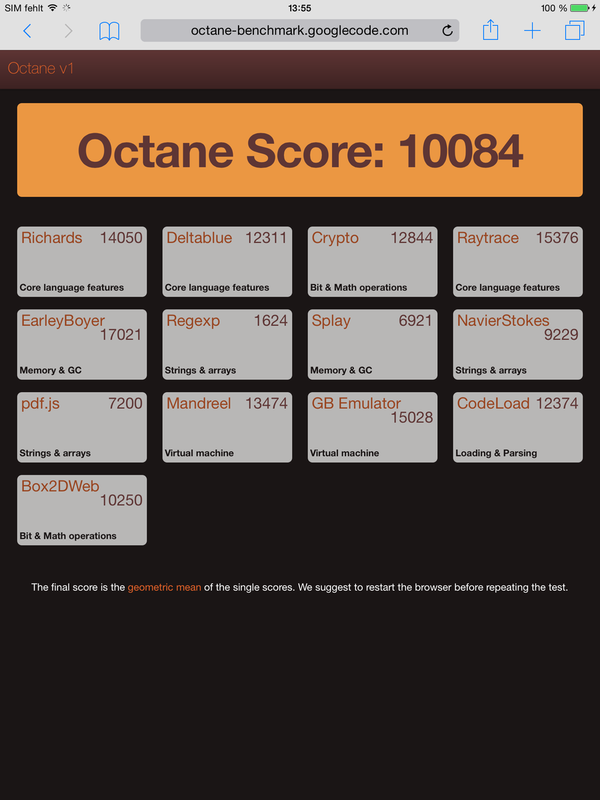 Subjectively, even complex websites are loaded very quickly and this impression is supported by the benchmarks. 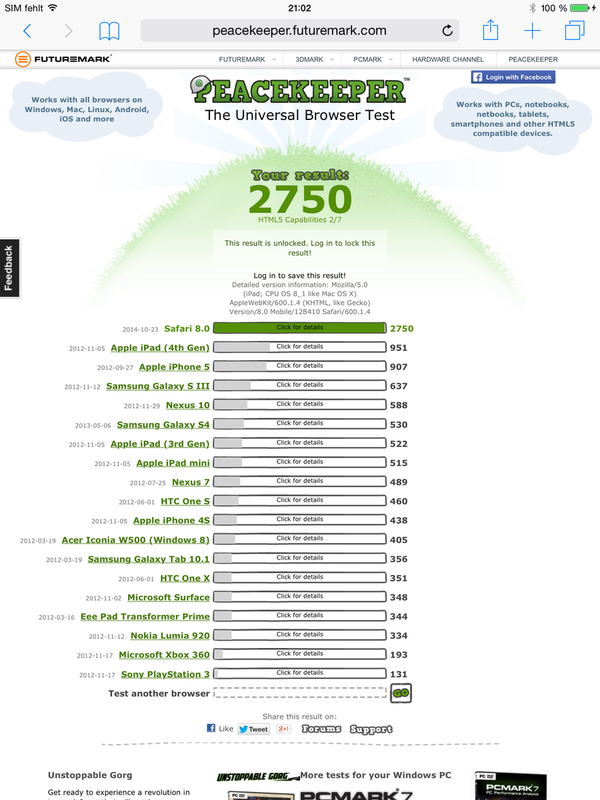 None of the comparison devices can keep up with the review unit in any of the tests. 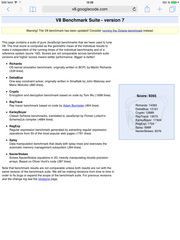 However, we had to run Browsermark 2.1 a couple of times before we were able to determine a result. 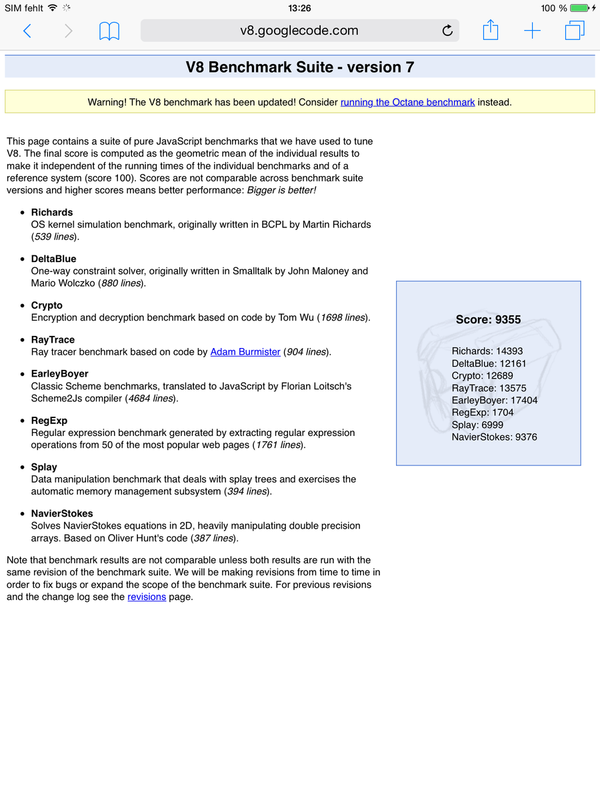 The benchmark crashed several times in the Safari browser, which then repeated the benchmark. The Apple iPad Air 2 is available with 16, 64 and 128 GB flash storage. The smallest version does not really make a lot of sense since you cannot expand the storage. It would have been better for the customer if Apple had abandoned the 16 GB version instead of the 32 GB version. 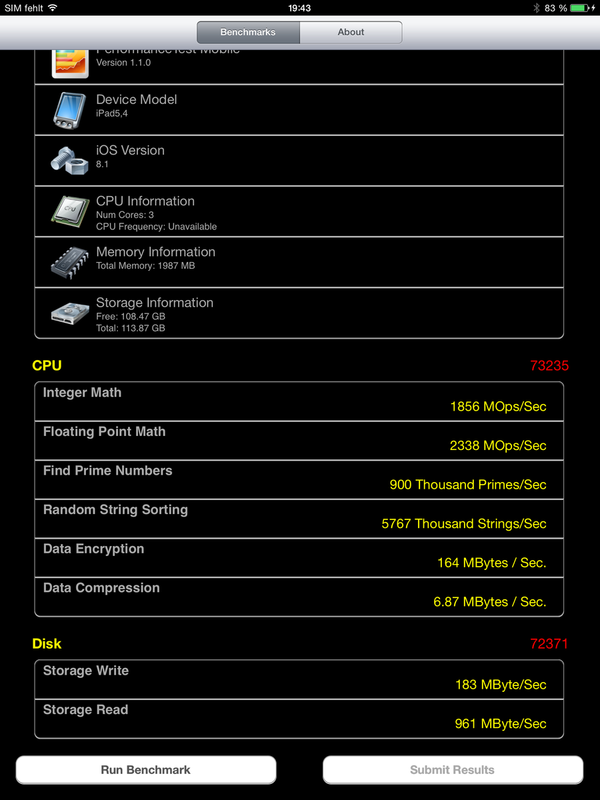 The largest configuration has 113 real GB, and around 109 GB are available for the user after the initial start. The performance of the storage once again cannot be beaten in the benchmarks, and in some cases achieved excellent results. The fast PowerVR GXA6850 graphics unit is ideally suited for gamers. 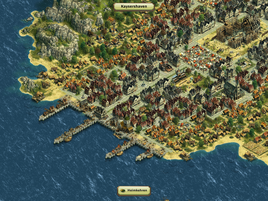 It provides an enormous amount of performance and supports OpenGL ES 3.0 as well as DirectX 10. 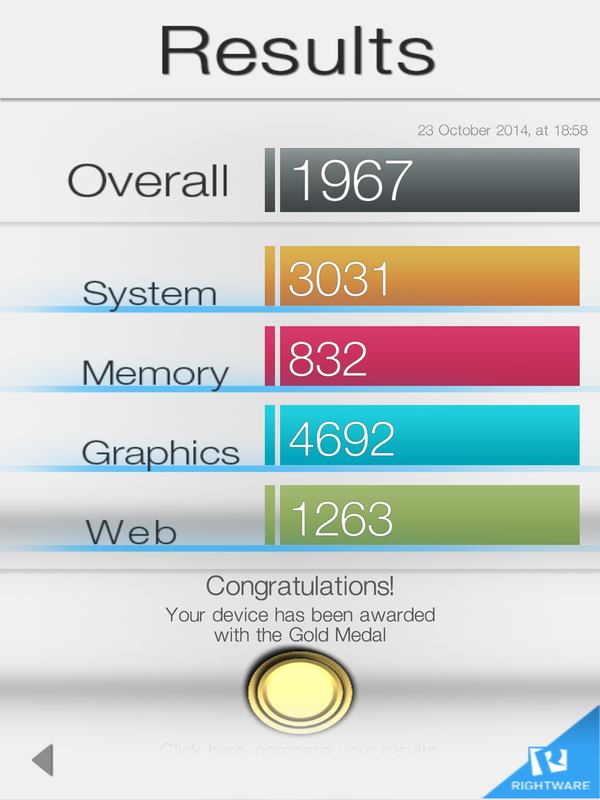 Apple also provides its own graphics interface Metal, which should improve the performance. Games from the App Store run smoothly and with maximum details, it does not matter if you play strategy titles like Anno or fast 3D games like Asphalt 8. The good touchscreen completes the gaming experience, and the sensors work without any problems. The surface temperatures of the Apple iPad Air 2 reach up to 32 °C (~89.6 °F) when idling, which means the tablet is not even lukewarm. Load results in values of up to 42.8 °C (~109 °F), which was measured at the back in the area of the SoC. The rest of the device reaches up to 36.2 °C (~97 °F). 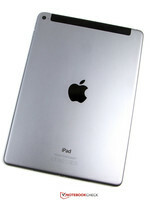 The results of the iPad are therefore not critical at all, but it is still the hottest device within the comparison. The coolest device is still the Surface 2 (up to 35.3 °C; ~95.5 °F). However, the high temperatures result in a performance reduction of the processor (around 29%) and the graphics unit (around 15%) under continuous load, which we have already mentioned in the Performance section. This scenario is very likely during gaming. 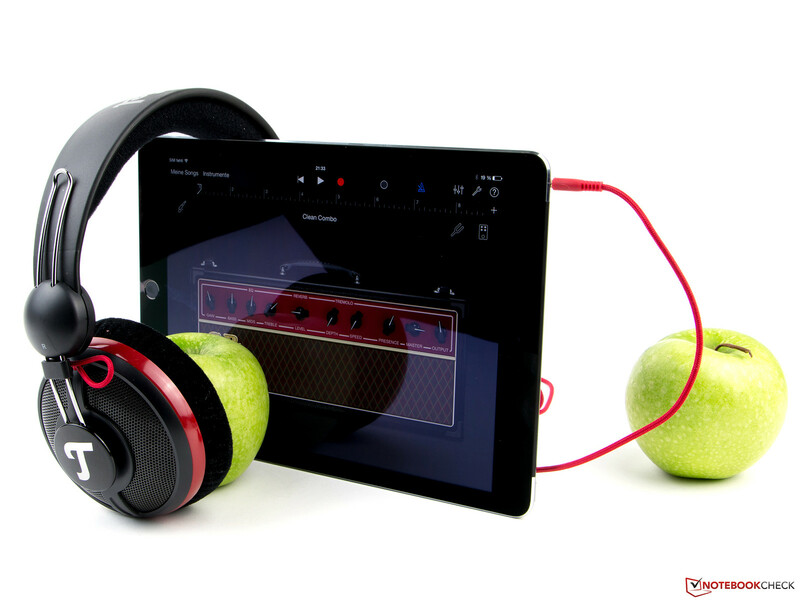 Powerful sound: the iPad Air 2. 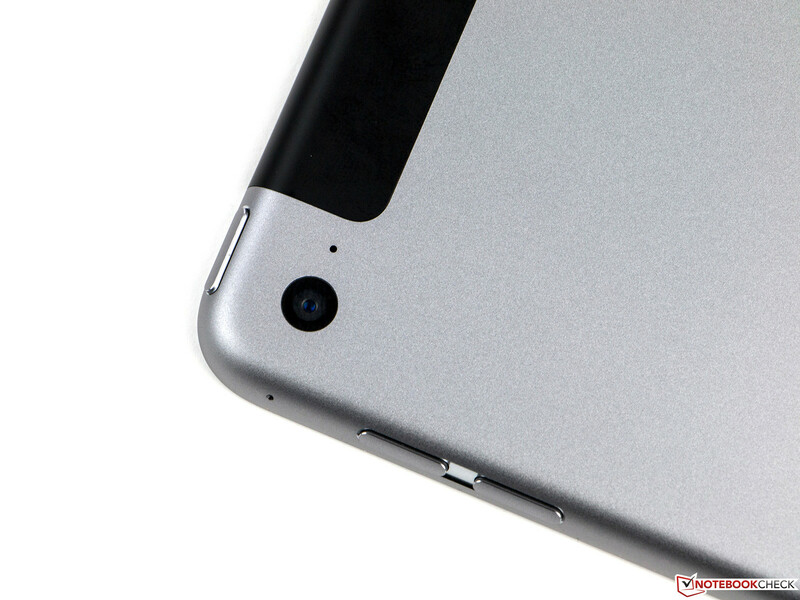 The Apple iPad Air 2 has two speakers located either side of the Lightning port. This configuration is similar to the predecessor, and we still think the position is not perfect. You can easily cover one speaker when you use the tablet in landscape mode. The quality of the components is surprising at first; we did not expect such powerful medium tones, and an audible as well as perceptible bass. However, the high tones suffer a bit from this, which is a problem during music playback at higher volumes in particular. The bass is also not very balanced in this case and tends to rattle. However, if you like to watch movies or play games on the tablet, then the speakers will be very effective, especially since the bass provides a haptic feedback that can be felt on the whole aluminum chassis. The stereo jack works flawlessly, and can produce a very loud sound. The provided power adaptor is insufficient. The consumption is significantly increased under load, and even slightly exceeds its predecessor (up to 10.4 Watts) with up to 11.1 Watts. This is the result of the more powerful components. We determined the value with the Relative benchmark. Lumia 2520 (up to 14.5 Watts) and Surface 2 (up to 15.8 Watts) consume even more power; the most frugal device within the comparison is the Xperia Z2 Tablet (up to 7.4 Watts). The supplied power adaptor is specified with 10 Watts by Apple, but it actually has a nominal output of 10.71 Watts (5.1 Volts, 2.1 Amps) and is therefore insufficient. This is interesting, as the manufacturer used to ship their iPads with 12 Watts PSUs since the fourth generation. We cannot understand Apple's decision to use a weaker power adaptor. By the way, the more powerful power adaptor is still available in the store. Because of the slim design of the iPad Air 2, the battery capacity had to be reduced, and is now at 27.62 Wh (3.76 Volts, 7,340 mAh). Still, Apple advertises web browsing runtimes of up to ten hours via WLAN and one hour less via LTE. 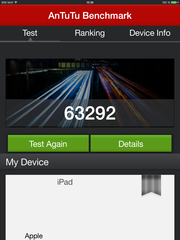 Our WLAN test simulates the first scenario, and is therefore a great way to verify the statement from the manufacturer. 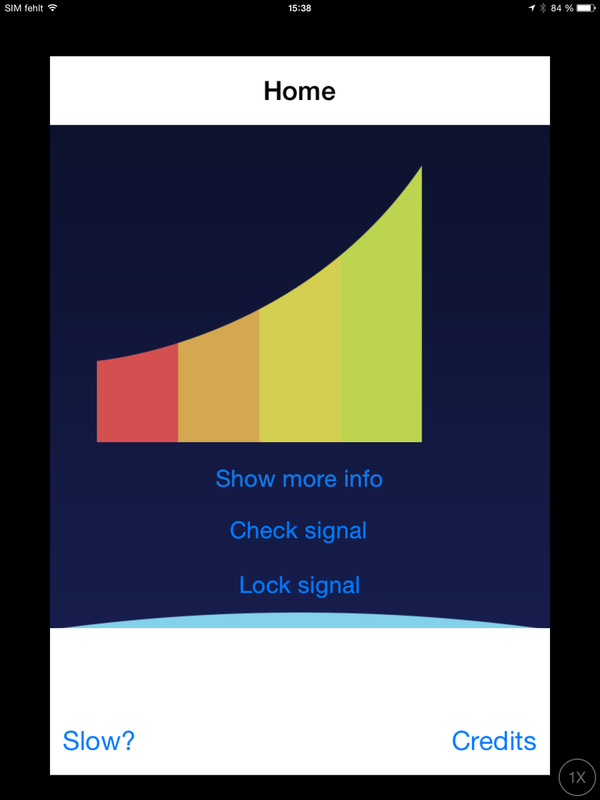 The test runs a script that loads a new website every 40 seconds with an adjusted display brightness of 150 cd/m², and an active WLAN connection. We determine a runtime of ten and a half hours, which even exceeds that of the predecessor. It is not really surprising that the minimum runtime is shorter when you consider the higher power consumption. All in all, the review unit manages very good results, but the competition is not bad. The charging times are very long with more than five hours, the weak power adaptor being responsible for this. 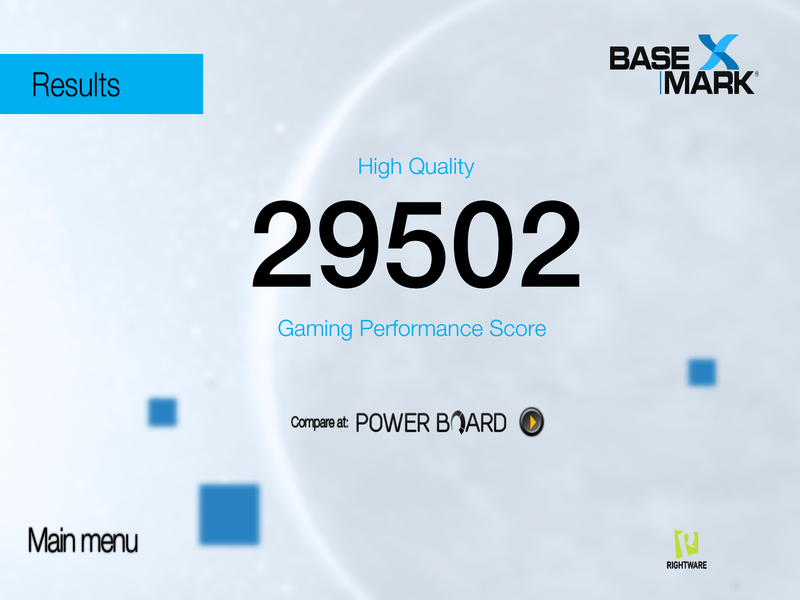 The situation is different when we look at the performance: The combination of the new A8X processor and the graphics unit PowerVR GXA6850 is very powerful and make it one of the fastest components currently on the market. Only the Nvidia Tegra K1 SoC can compete, and even sometimes beat the product from the Californians. It will be interesting to see if the Google Nexus 9 tablet will have throttling issues under continuous load as well. This is a bit annoying in the case of the iPad Air 2, since the CPU performance almost drops to the level of the A7 in Geekbench 3. 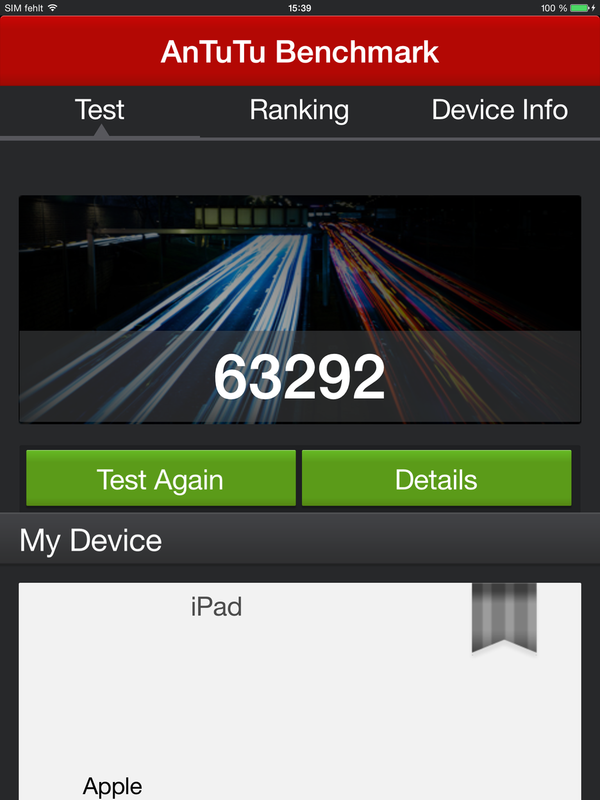 Still, the iPad is very fast, and the performance degradations are currently not noticeable. 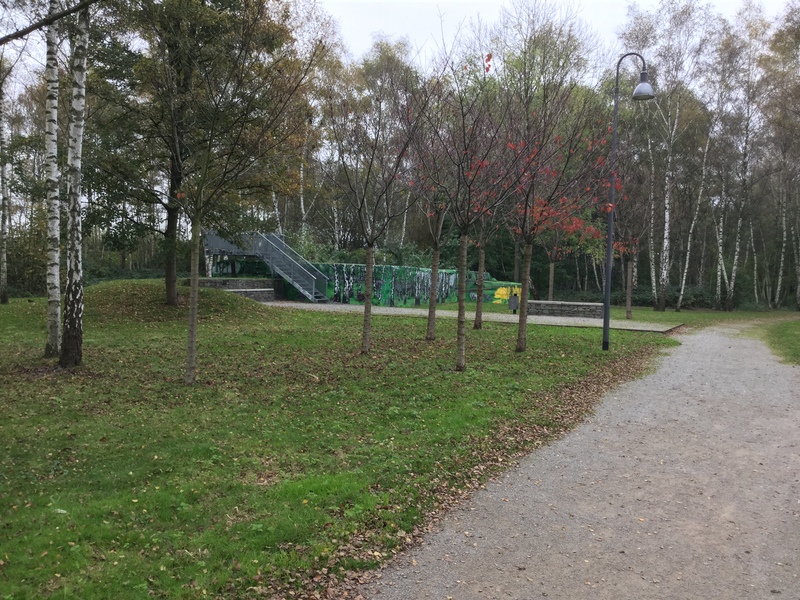 The design did not really change. 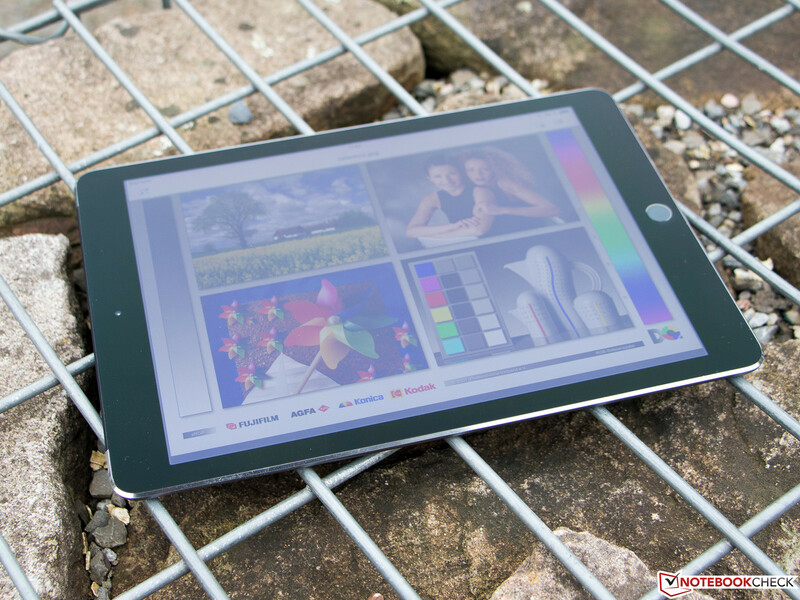 The iPad Air 2 has one of the best tablet displays on the market. The webcam catches a lot of light. Touch ID is now available for the iPad as well. The camera was significantly improved. The corresponding tool to open the slot is inside the box. It is easy to remove the tray with the tool. The power adaptor is not powerful enough. 109 GB are available for the user. 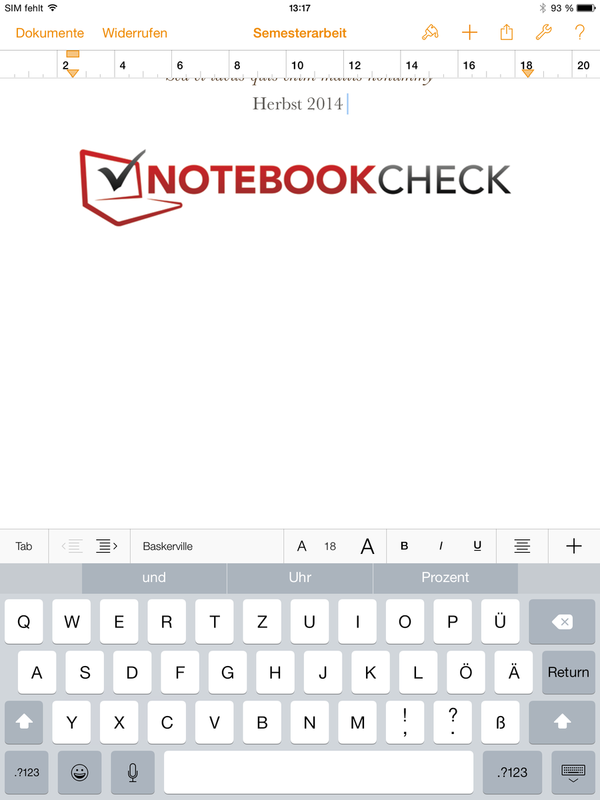 The iPad Air 2 is not only nice to look at, but also really fast. 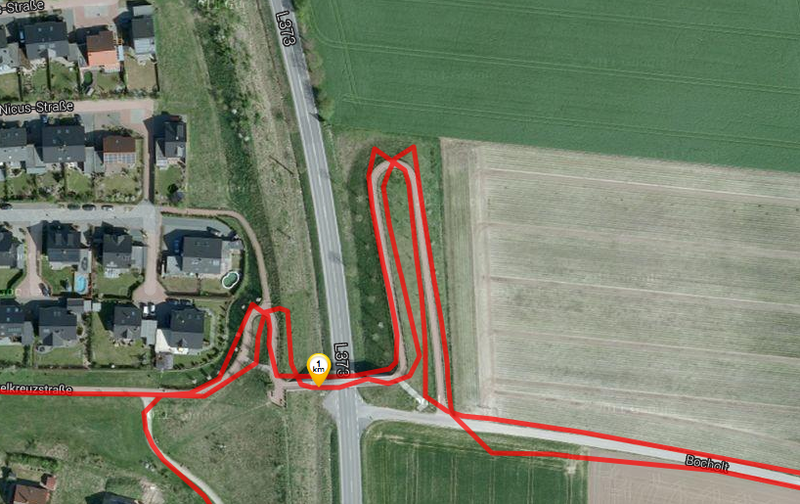 It has a very good GPS module as well. We expect state of the art technologies from a high-end device with a high-end price. But neither Bluetooth 4.1 nor LTE Cat. 6 are available. We cannot understand why Apple includes a weaker power adaptor when the power consumption is higher. The competitors are the Samsung Galaxy Tab S 10.5 as well as Galaxy Note 10.1, Sony Xperia Z2 Tablet, Microsoft Surface 2 and the Nokia Lumia 2520.